Sorority sisters one of the Greek homes at USC “speak” only in Harry Potter GIFs -- a way to communicate on their smartphones that bonds them the way a secret handshake might have done many years ago. But this isn’t many years ago or even five years ago. This is now -- an era of new ways to communicate that seemingly excludes actual speech. It's everywhere. A couple of hours ago, The Hill reported that Ukraine’s official Twitter feed just used a GIF* from “The Simpsons” to mock Russia. 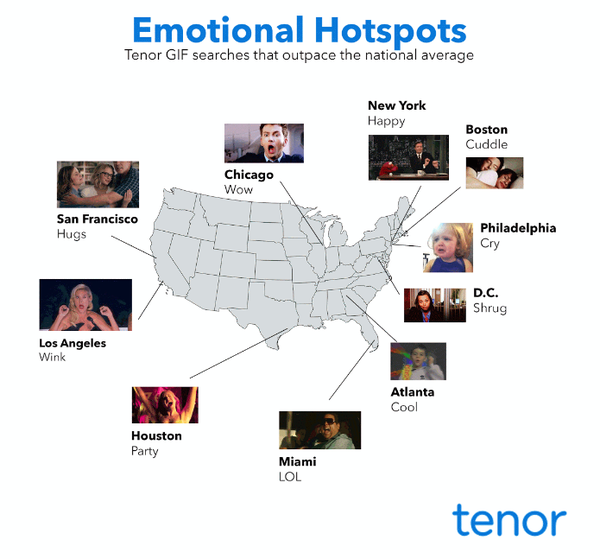 Every year, smartphone GIF pioneer Tenor counts 72 billion GIF mobile search requests (200 million a day, but searchers look for more than one term). Tenor is just beginning to attempt to monetize those millions of quick images. When you search for a GIF that says you’re SO tired, wouldn’t the image of a bleary-eyed person sipping from a Starbucks cup be a good GIF spot? That’s the commercial idea. The GIF (for Graphics Interchange Format) has actually been around for 30 years -- its precise anniversary may have occurred yesterday. But their utility for something other than just a quick, repeating graphic is because of the smartphone, says David McIntosh, the CEO who founded Tenor in 2014. That’s where Tenor made its mark. It transacted one million smartphone GIF downloads in its first month in business. “The phone. It started as communication. You would call to talk to someone,” McIntosh intones, sounding a little like the narrator of his own retelling of history. “As phones got digital, texting became the preferred method of communication. The challenge with texting is that we have such a rich language now, for a thousand years, people could write beautiful letters and draw on this wonderful vocabulary. The new Tenor Insights is an “Emotional Graph” dashboard refreshed by 200 million users every month -- which McIntosh says can pinpoint the emotions of the moment --hungover blurs on Saturdays and Sundays, contentedly not very “tired” (surprisingly) during holidays. So far, its videos have been supplied by its users and willing marketers, like Hollywood studios. Twentieth Century Fox was able to promote “Taken 3” before it was well known,with a few good GIFs. In March, Tenor brought in Jason Krebs -- a veteran of Maker Studios, Conde Nast and Tremor Video -- as its chief business officer, and to market those briefest of branded videos. McIntosh thinks Krebs should have a pretty good pitch. Pricing GIFS at a cost per share, he thinks, works because every GIF is a guarantee that at least two people have seen the image -- the person who chose it and the person who receives it. “When is the last time you didn’t open a text message?” McIntosh asks. “We hire both kinds of people here,” McIntosh says.. “I think it’s about 60-40, for the hard G, at the office. I go back and forth.